“Jordan has a special gift for teaching. The students of hers I’ve met speak of her glowingly and her abilities shine through in this video. The lessons are compact but systematic and her natural directness with the camera conveys a confidence that the users of this video can really “get” the steps she’s sharing. She has a beautiful, relaxed style, but one of the most impressive things in the video is how apparent the melody is in her footwork. It is very easy to hear the tunes in her feet. And speaking of tunes, she has a pair of outstanding musicians joining her here. Armand Aromin (fiddle; he’s also a fiddle maker arominviolins.com) & Benedict Gagliardi (concertina; thevoxhunters.com) provide excellent music and lift here, as evident in Jordan’s dancing. In Musical Feet! 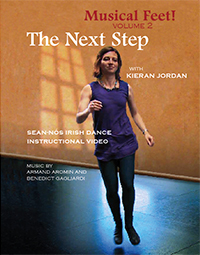 Volume 2: The Next Step, Boston-based dancer Kieran Jordan brings you an in-depth instructional video on sean-nós Irish dancing. With six chapters of jigs, and an additional chapter of reels, this video series invites students of all ages to learn, practice, and experience the joy of rince ar an sean-nós — “dancing in the old style.” The video includes both traditional and original steps that progress from basic rhythmic movements to more advanced choreography. With live music, close-ups of the footwork, and clear instruction from an experienced teacher, this video aims to inspire dancers everywhere — to develop a confident ability to make rhythm, improvise, and participate in the art of sean-nós dance. Armand Aromin is a musician, composer, and violin maker and repairer based in Providence, Rhode Island. As a teen, he learned much of his Irish music from Jimmy Devine and Patrick Hutchinson, and subsequently spent six of his post-secondary-school years soaking up the wealth of traditional music that Boston has to offer. Armand and Benedict have been making music together for the past three years, and formed the duo The Vox Hunters in 2014. Benedict Gagliardi is a multi-instrumentalist and singer from Berlin, Connecticut. His fondness for traditional music began in his mid-teens, with American folk and sea songs, which quickly lead to Irish music. Benedict has never received formal lessons on concertina, but owes much of his style and repertoire to many encouraging Connecticut musicians who taught him tunes over the years. Though he can’t dance a step himself, he takes great satisfaction in supplying tunes for the musical feet of others. When not playing music, Benedict is out in the woods catching insects.